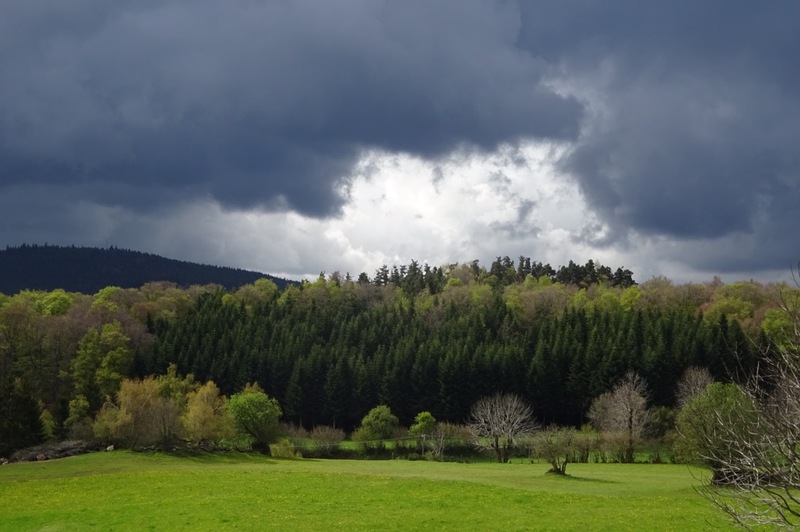 A maddening mixture of rain and sun today as we continued our walk over the Margeride hills and forests. We ate lunch in the garage of a farm house which had been converted into a humble cafe for passing pilgrims. All very rural but enterprising. The French know that one of the best places to stay on the entire route is “Le Sauvage”, a farming commune with an impressive gite and all the local produce you can eat. So I was not surprised to find it full when I tried to reserve. Not to worry, I made a reservation in the next village. So after leaving “I” at “Le Sauvage”, I ambled along and visited the little Chapel of St Roch on the site of a 12th century pilgrims hospital run by the Knights Templar. It was 5pm when I reached my gite, La Bergerie de Compostelle in La Roche. Madame had no reservation for me and the place was full. And a full gite resembles an air raid shelter during the Blitz. I was not enthusiastic about walking another 2 hours to the next village but then Madame had a brainwave no doubt spurred on by the thought of 36 Euro going begging. I could sleep in the wardrobe. Soon a mattress was produced and here I am. Madame said dinner would be “c’est impossible” due to a shortage of pommes des terre but she is working on something which I’m about to discover. I’d like to see a photo of the wardrobe!! I never took one. It was just like the one that leads to Narnia except it didn’t.